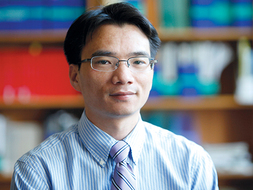 Dr. Zeng, a health economist and physician, is an Assistant Research Professor at the Schneider Institutes for Health Policy at the Heller School. He has more than 15 years of experience of conducing studies in health care systems, health financing, and cost-effectiveness analysis in health in both developed and developing countries. Many of his research studies have concerned comparative evaluation of policies, programs, and interventions in improving access and utilization of health services, and health outcomes, as well as associated resources. His another research interest focuses on examining fund flow in the health care system to identify efficiency gaps to promote the efficiency of programs. He has worked on Public Expenditure Tracking Survey and National Health Accounts in Afghanistan. Previously he worked closely with UNAIDS to evaluated the performance of national HIV/AIDS program in reaching target population. Dr. Zeng has conduct research in Afghanistan, China, Haiti, the Republic of Congo, Rwanda, Ethiopia, Singapore, the United States, and Uzbekistan. His research has received support from the World Bank, USAID, UNAIDS, the Gates Foundation, the Centers for Medicare & Medicaid Services, and the Robert Wood Johnson Foundation. Dr. Zeng received his MD degree from Fujian Medical University (China), and has a PhD degree from Brandeis University. Luo XW, Law S, Wang X, Shi JZ, Zeng W, Chow W, Ma XQ, Zhao W, Liu SY, Liu XL, Yao SQ, Phillips MR.. "Effectiveness of the assertive community treatment program for persons with severe mental illness in mainland China --- A 12 month randomized controlled trial." Psychological Medicine (2018): 1-11. Mansell K, Yaghoubi M, Vatanparast H, Steeves M, Zeng W, Farag M. "Prevalence of diabetes-related complications and their association with determinants identified in Canada’s survey on living with chronic diseases --- Diabetes component (SLCDC-DM-2011)." Canadian Journal of Diabetes 42. 5 (2018): S57. Zeng W , Rusatira J, Blaackman A, Nsitou B, Shepard DS. "Evaluation of results-based financing in the Republic of Congo: A controlled pre-post study." Health Policy and Planning (2018). Zeng W, Halasa Y, Baurin N, Coudeville L, Shepard DS.. "Cost-effectiveness of dengue vaccine in 10 countries." Vaccine. 36 (2018): 413-420..
Zeng W, Halasa YA, Durand L, Coudeville L. Shepard DS. "Impact of a non-fatal dengue episode on disability-adjusted life years: A systematic analysis." American Journal of Tropical Medicine & Hygiene 99. 6 (2018): 1458-65. Zeng W, Lannes L, Mutasa R. "Utilization of health services and out of pocket health expenditure in Zimbabwe: Results from a national household survey." Health Systems & Reforms 24. (2018): 1-13. Zeng W, Shepard DS, Nguyen HTH, Chansa C, Das AK, Qamruddin J, Friedman J. "Cost-effectiveness analysis of results-based financing in Zambia: Results from a cluster-randomized trial." Bulletin of the World Health Organization 96. (2018): 760-771. Zeng W, Sun DX, Nair D, Nam JE, Gheorghe A. "Strengthening performance-based financing as a health system approach for quality improvement." Journal of Global Health 8. 2 (2018): 1-5. Du XW, Zhou J, Wang HM, Shi JF, Kuang Y, Zeng W, Yang ZM, Xu B.. "In situ generated D‐peptidic nanofibrils as multifaceted apoptotic inducers to target cancer cells." Cell Death and Disease 8. 2 (2017): e2614. Sun DX, Ahn H, Lievens T, Zeng W. "Evaluation of the performance of national health systems in 2004-2011: An analysis of 173 countries." PLoS ONE 12. 3 (2017): e0173346. Yaghoubi M, Mansell K, Vatanparast H, Steeves M, Zeng W, Farag M. "Effects of pharmacy-based interventions on the control and management of diabetes: a systematic review and meta-analysis." Canadian Journal of Diabetes 41. 5 (2017): S26. Zeng W, Halasa YA, Cros M, Akhter H, Nandakumar AK, Shepard DS. "Costing the essential service package provided by a non-governmental organization network in Bangladesh." Health Policy and Planning 30. 10 (2017): 1375-1385. Zeng W, Kim C, Arch L, Sayedi O, Jabarhil M, Sears K. "Assessing the feasibility of health insurance feasibility in Afghanistan: A qualitative stakeholder analysis." BMC Health Services Research 17. (2017): 157. Zeng W, Lannes L, Mutasa R, and NHA field team. National health accounts in Zimbabwe 2015. Harare Ministry of Health & Child Care of Zimbabwe and World Bank: 2017. Zeng W, Li GH, Ahn H, Nguyen H, Nair D. "Systematic review of cost-effectiveness of health system interventions in improving maternal and child health." Health Policy and Planning (2017). Zeng W. Evaluation of efficiency of health facilities providing HIV/AIDS services in Botswana. Report for HFG, Abt Associates: 2017. Bowser D, Zeng W, Akobirshoev I, Morrill T, Nandakumar AK. "The impact of health care spending and income inequality on stunting prevalence." International Journal of Healthcare 2. 2 (2016): 26-30. Health Sector Resiliency Project. Potential revenues to increase government investment in health in Afghanistan: Fiscal space analysis. Washington DC Health Sector Resiliency Project: 2016. Kim C, Saeed KMA, Salehi AS, Zeng W. "An equity analysis of utilization of health services in Afghanistan using a national household survey." BMC Public Health 16. (2016): 1226. Schurer J, Rafferty E, Schwandt M, Zeng W, Farag M, Jenkins E. "Toxoplasosis and toxcariasis: an assessment of HIV co-morbidity and health care costs in Canada." American Journal of Tropical Medicine & Hygiene. 95. 1 (2016): 168-174. Zeng W, Gautam G, Hashimi M. Literature review of user fees at the secondary and tertiary care in low- and mid-income countries. Washington DC Health Sector Resiliency Project: 2016. Zeng W, Gheorghe A, Nair D. Health system level approaches to addressing quality of care in low- and middle- income countries. Washington DC The World Bank: 2016. Zeng W, Halasa YA, Cros M, Shepard DS. Costing the essential service package within non-governmental organization network of smiling sun in Bangladesh. Dhaka, Bangladesh Pathfinder: 2016. Zhang R, Unduurage U, Zeng W, Victoria RG, Tanner S, Leonard W, Behrman J, Godoy R.. "Catch-up growth and growth deficits: Nine-year annual panel child growth from native Amazonians in Bolivia." Annals of Human Biology 43. 4 (2016): 304-15. Ahn H, Roll S, Zeng W, Jacobson J, Ko J. "Does income inequality reduce workers’ life satisfaction? Analysis of hierarchical linear model of workers’ self-rated life satisfaction in the US." Social Indicator Research (2015). Alkenbrack S, Chaitkin M, Zeng W, Couture T, Sharma S. "Are maternal health services becoming more equitable? Trends and determinants across 65 low- and middle-income countries." PLOS One (2015). Chen A, Zeng W. Costing the program of savings and internal lending communities (SILC) in Zambia. Washington, DC Palladium: 2015. Fagan T, Zeng W. Sustainable HIV Financing in Zambia: Baseline analysis and prospects for new domestic resource mobilization.. Washington DC Palladium, Health Policy Project: 2015. Schurer JM, Rafferty E, Farag M, Zeng W, Jenkins E. "Echinococcosis: An economic assessment of veterinary public health intervention in rural Canada." Plos Neglected Tropical Diseases (2015). Shepard DS, Zeng W, Nguyen HTH. Toolkit for cost-effectiveness analysis of results-based financing program. Washington DC World Bank: 2015. Zeng W, Khorloo E, Nam JE. Situation analysis of family planning in Mongolia. Ulaanbaatar UNFPA: 2015. Zeng W, Kim C, Arch L, Sayedi O, Jabarhil M, Sears K. A health insurance feasibility study in Afghanistan: learning from other countries, a legal assessment and a stakeholder analysis. Washington, DC Futures Group, Health Policy Project: 2015. Zeng W, Shepard DS, Avila C, Ahn H. "Resource needs and gap analysis in achieving universal access to HIV/AIDS services: a data envelopment analysis of 45 countries.." Health Policy and Planning (2015). Halasa Y, Zeng W. Chappy E, Shepard DS. "Value and impact of international hospital accreditation: The case of Jordan.." Eastern Mediterranean Health Journal (2014). Medica Synergie, Zeng W, Sayedi O.. Public Expenditure Tracking Survey (PETS) in Kabul National Hospitals.. Washington, DC: Futures Group, Health Policy Project: 2014. Yan JQ, Zeng W. "The trade-offs between efficiency and quality in the hospital production.." China Economic Review 31. 2 (2014): 166-184. Zeng W, Kim C, Arch L, Jabarkhil M, Sears K, Saydi O. Stakeholder analysis of feasibility of health insurance in Afghanistan. Washington, DC Futures Group, Health Policy Project: 2014. Zeng W, Kim C. Report on a health financing scoping mission in Uzbekistan. Tashkent UNICEF-Uzbekistan: 2014. Alkenbrack S, Young D, Zeng W, Scott A.. Examining HIV/AIDS Treatment and Testing Through an Equity Lens in Kenya.. Washington, DC Health Policy Initiative Costing Task Order: 2013. Gaumer G, Zeng W, Nandakumar AK. "Modeling the returns on scaling up malaria program in Ethiopia." Health Policy & Planning (2013). Kaufman J, Zeng W, Wang LY, Zhang Y. "Community based mental health counseling for AIDS orphans in China.." AIDS Care (2013). Liang K, Meyers K, Zeng W, Gui X. "Predictors of elective pregnancy termination among women diagnosed with HIV during pregnancy in two regions of China." BJOG (2013). Magvanjav O, Undurraga E, Eisenberg D, Zeng W, Dorjgochoo T, Leonard W, Godoy R. "Sibling composition and children’s anthropometric indicators of nutritional status." Annals of Human Biology 40. 1 (2013): 23-34. Zeng W, Cros M, Dilley KM, Shepard DS. "Impact of performance-based financing on primary health care services in Haiti.." Health Policy and Planning (2013). Zeng W, Parida S, Zycherman A, Magvanjav O, Rubio K, Nyberg C, et al. "Sibling composition during childhood and adult blood pressure among native Amazonians in Bolivia." Economics & Human Biology (2013). Zeng W, Rwiyereka AK, Amico P, Avila-Figueroa C, Shepard DS. "Performance of HIV/AIDS health centers and the effect of community base health insurance and performance based financing on HIV/AIDS service delivery in Rwanda." American Journal of Tropical Medicine & Hygiene (2013). Zeng W, Stason WB, Fournier S, Razavi M, Shepard DS. "Benefits and costs of intensive lifestyle modification programs for symptomatic coronary disease in Medicare beneficiaries." American Heart Journal (2013). Brandeis/EPOS research team. Performance based financing in the Republic of the Congo (Phase I). Brazzaville, Republic of the Congo Ministry of Health and Population, Republic of the Congo: 2012. Halasa Y, Shepard DS, Zeng W. "Aggregate economic cost of dengue in Puerto Rico." American Journal of Tropical Medicine and Hygiene 86. 5 (2012): 745-752. Heller Research Team. Tackling malaria and pneumonia: New approaches to improving return on investment. Waltham Brandeis University: 2012. Shepard DS, Zeng W, Amico P, Kanyange AK, Avila C. "A quasi-experimental study of HIV funding as resource capacity building in the Rwandan health system." The American Journal of Tropical Medicine 86. 5 (2012): 902-907. Shepard DS, Zeng W, Strickler GK, Lwin AK, Cros MJ, Garner BR. "The brief treatment cost analysis tool (TCAT-Lite) for substance abuse treatment: Reliability and application." Alcoholism Treatment Quarterly 30. 4 (2012): 377-396. Zeng W, Eisenberg D, Jovel RK, Undurraga AE, Castano J, Nyberg C, Tanner S, Reyes-García V, Leonard W, Castano J, Huanca T, McDade T, Godoy R. "Adult obesity: Panel study from native Amazonians." Economics and Human Biology 11. 2 (2012): 227-235. Zeng W, Jovel RK, Undurraga AE, Broesch J, Eisenberg D, Nyberg C, Tanner S, Reyes-García V, Leonard W, Castano J, Huanca T, McDade T, Godoy R. "Sib composition and child educational attainment: Theory and evidence from native Amazonians in Bolivia." Economics of Education Review 31. 6 (2012): 1017. Zeng W, Shepard DS, Chilingerian J, Avila C.. "How much could we gain from improved efficiency? An examination of performance of national HIV/AIDS programs and its determinants in developing countries." BMC Health Services Research 12. (2012): 74. Zeng W, Shepard DS. Global out-of-pocket spending on HIV/AIDS. Geneva UNAIDS: 2012. Shepard DS, Zeng W. Design of health insurance for The Gambia. Banjul International Health Partners and The Department of State for Health, Social Welfare & Women’s Affairs, The Gambia: 2011. Zeng W, Shepard DS, Kanyange AK, Amico P, Avila C. Does the policy work? An evaluation of HIV/AIDS health centers in Rwanda. Geneva UNAIDS: 2011. Shepard DS, Zeng W, Lwin T. Methods for evaluating performance based financing in Haiti, Rwanda, and Afghanistan. Report prepared for Management Sciences for Health. Cambridge: 2010. Shepard DS, Stason WB, Strickler GK, Lee JA, Bhalotra S, Ritter G, Suaya JA, Gurewich D, Fournier S, Zeng W, Razavi SM, Hurley CL. Evaluation of Lifestyle Modification and Cardiac Rehabilitation in Medicare Beneficiaries (Executive Summary). Centers for Medicare & Medicaid Services (CMS). Baltimore: 2009. Shepard DS, Strickler GK, Zeng W, Ritter G, Stason WB, Bhalotra S. Impact and cost- effectiveness of the Medicare Lifestyle Modification Program Demonstration. Centers for Medicare & Medicaid Services (CMS). Baltimore: 2009. Zeng W, Shepard DS, Kanyange AK. Linking HIV/AIDS spending with service delivery in Rwanda. Geneva, Switzerland Report prepared for UNAIDS: 2009. Zeng W, Shepard DS, Avila C. Resource needs and gap analysis in achieving the targets of universal access to prioritized HIV/AIDS services by 2010. Geneva, Switzerland Report prepared for UNAIDS: 2009. Zeng W, Shepard DS. Filling in data gaps: a trend approach. Report prepared for UNAIDS. Geneva, Switzerland: 2009. Shepard DS, Tyo KR, Seidmann MR, Zeng W. Cost-effectiveness of pneumococcal vaccination among children in Singapore. Report prepared for the Singapore Ministry of Health. Singapore: 2008. Shepard DS, Zeng W, Neuman MJ, Kanyange AK. Critical Review of Costing Models to Estimate Resource Needs to Address Global HIV and AIDS. Technical report to UNAIDS. Geneva, Switzerland: 2007. Shepard DS, Zeng W, Neuman MJ, Kanyange AK. Novel and Alternative Approaches to Estimate Global Resource Needs to HIV and AIDS. Technical report to UNAIDS. Geneva, Switzerland: 2007. Ma J, Xu G, Zeng W. "Lessons from Payment Reform in Korean Health Care Systems (in Chinese)." Chinese Health Economics 23. 4 (2004): 77. Shi R, Cai Y, Zeng W,. "Analysis of the Impact of Social-economic Factors on SARS Risk Behavior in Shanghai Community Residents (in Chinese)." Chinese General Practice 6 (2003): 481-485. Zeng W, Huang ZJ.. "Effects of Mental Health on the Academic Performance in Medical Students by Linear Structure Relations (in Chinese)." Chinese Mental Health Journal 17. 10 (2003): 659. Zeng W, Yan YS. "Gene Therapy Strategies for AIDS (in Chinese)." Strait Journal of Preventive Medicine 7. 2 (2001): 24. Huang ZJ, Zeng W. "The Application of Life Quality Evaluation in Leukemia Patients (in Chinese)." Chinese Journal of Clinical Psychology 8. 2 (2000): 118.